Not to be confused with the 1989 bone-cracking mulletfest starring Patrick Swayze, Road House (1948) is a bar-centric noir tale of a lounge singer who can’t sing and the men obsessed with her. It’s also a story about bowling, miscarriage of justice, chain-smoking, and drunken gunplay. However, being that Road House is a film noir, shot in silvery shades of black and white, the movie is fundamentally about shadow, mood, and attitude. Ida Lupino plays the lounge singer, Lily Stevens, a city girl hired by a small town club owner named Jefty (Richard Widmark) to perform in his bar/bowling alley. Lily’s singing voice is slight, diminished to a hoarse rasp from years of chain smoking, but Jefty’s main interest in Lily doesn’t involve her vocal chords. Unfortunately for Jefty, Lily not only spurns his advances; she makes moves of her own on Pete Morgan (Cornell Wilde), Jefty’s clean cut childhood friend and the manager of Jefty’s Road House. Although Pete initially takes a dislike to the smoky songstress, he eventually warms to her. The budding romance leads to a planned elopement; but when Jefty discovers the couple’s plans, he frames Pete for a petty theft to keep his friend’s hands off the girl he covets. While Pete avoids prison, there’s no avoiding Jefty, and the lopsided love triangle is doomed to collapse violently. 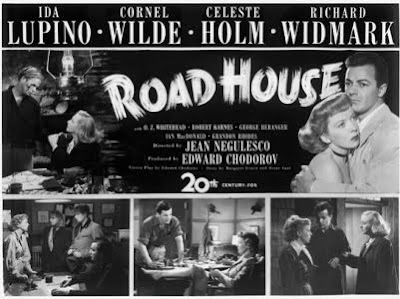 Road House is usually categorized as a film noir, although it is missing some of the usual trappings of the genre. Noirs as a rule are city-bound, featuring rain swept streets, filth-ridden alleyways, and fedora-wearing hoodlums. Instead, Road House gives us rustic lodges, bowling alleys, and hunting jackets. Noirs also generally feature a “doomed man” lead (often a first-person narrator) that is drawn by circumstances toward an inevitable end of failure or death. While there are some aspects of the “doomed man” plot attached to Cornell Wilde’s role, he is in no way the lead (Lupino owns the first half of the film and Widmark steals the remainder), and Wilde’s fate is neither as dark or inescapable as that of his noir counterparts. Still, despite these atypical aspects, Road House is most definitely a noir. The dead animal carcasses that decorate Jefty’s joint are every bit as threatening as the alleyways of Chicago, especially when illuminated by a few shafts of light in the dimly lit bar. The clipped, smart aleck dialogue is also very much in the noir style, and professionals like Lupino, Widmark, Celeste Holm make the script sing. While some of the plot points are implausible--it's difficult to imagine that Lupino’s singing would increase business in the bar, that Pete’s attitude toward Lily would make such a swift 180, or that a judge would release Pete in Jefty’s custody--the film makes up for these lapses in logic with atmosphere and aggression. Attitude is everything in a film noir, and Road House has attitude to spare. Potent Quotables--JEFTY: I won’t miss it. I’m the best shot in the world. And when I get drunk, I’m a better shot. I’m a better shot. The drunker I am, the better I get. Similarly Sauced Cinema--One of the only other film noirs to feature a rustic setting is the greatest motion picture ever produced in the genre, Out of the Past (1947).